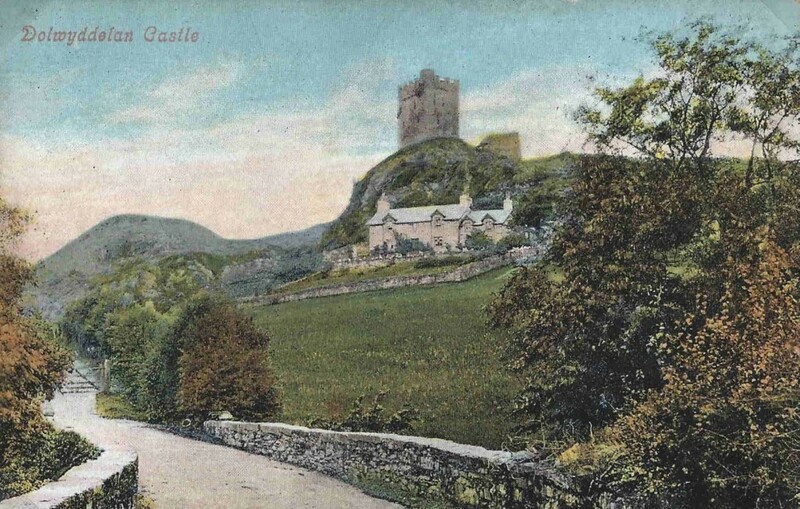 The original wooden castle , believed to be the birth place of Llywelyn The Great (C1172-1240) stood on a rocky knoll on the valley floor below the present day castle. 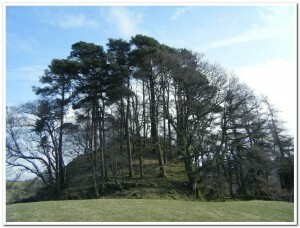 The wooded knoll can be clearly seen opposite the castle. 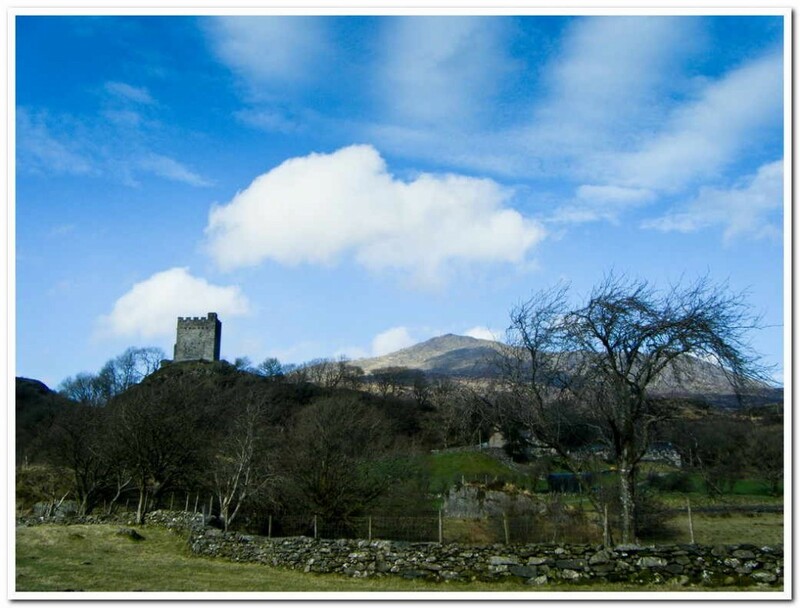 Llywelyn, the ruler of North Wales for 40 years and practically all of the rest of Wales for a substantial part of that time, built Dolwyddelan Castle in about 1210. The square tower was renovated to its present condition in Victorian times. The Courtyard was walled late in the thirteenth century. After falling into English hands (Edward 1st 1283) a second tower was added which unfortunately is now little more than a ruin. 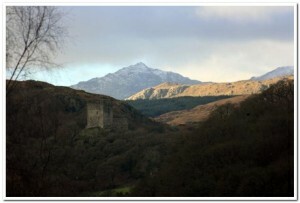 The castle is situated just off the A470 on the Blaenau side of Dolwyddelan and approx 5 miles from Betws-y-Coed. The Hall – early halls were aisled like a church with rows of wooden posts or stone pillars supporting the timber roof. Windows had wooden shutters, glazed windows were not common until 14th century. Carpets were used on walls, tables and benches, floors were earth, stone or plaster. Lighting was by rush lights or candles of wax or tallow. Oil lamps in bowl form, or suspended in a ring provided better illumination and flares sometimes hung from iron rings in the wall. The fireplace provided heat directly and by radiation from the stones at the back and the hearth. Smoke rose through a louvre in the roof with side openings that were covered with sloping boards to exclude rain and snow, that could be closed by pulling strings like a venetian blind. The Kitchen – in the 13th century the castle kitchen was mainly timber with a central hearth or several fireplaces where meat was cooked on a spit or stewed in cauldrons. Poultry and animals for slaughter were tethered nearby. The kitchen garden was planted with fruit trees, vines and herbs. There could also be a fish pond stocked with trout and pike. 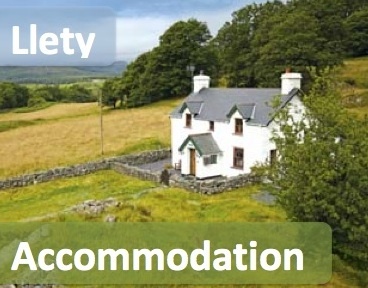 Accommodation – The lord and ladies chamber was situated on an upper floor and called a solar. The bed was a heavy wooden frame with springs made of interlaced ropes or strips of leather, with a feather mattress, sheets, quilts, fur covers and pillows. The bed was often dismantled and taken on frequent trips by the lord and lady when visiting other castles and manors. Servants and military personnel slept in towers or in basements, halls, or lean to structures. Water for washing and drinking was from a central drawing point on each floor. Hand washing was sometimes done at a built in basin in a recess in the hall entrance with a projecting trough. Servants filled the tank above and waste was carried away by a lead pipe below, inflow and outflow controlled by valves with bronze or copper taps and spouts. Baths were taken in a wooden tub – in warm weather the tub was often placed in the garden and in cold weather in a chamber near the fire. When the Lord and Lady travelled he took the tub with him, along with a bathman who prepared the baths. The latrine was sited close to the bed chamber at the end of a right angled passage in the thickness of the wall. When the chamber walls were not thick enough a latrine was corbeled out from the wall over a moat or river. One of the main features of the castle of a great Lord was the chapel where the lord and his family heard morning mass. By the end of the 13th century the castle had achieved quite a degree of comfort and privacy. The lord and lady who had spent their time eating and sleeping in the Great Hall with their household now had their own apartments.